Lama Zopa Rinpoche presiding over Lama Chöpa. The five dakinis are also shown with the Jade Buddha for Universal Peace in the background. The Great Stupa of Universal Compassion, Bendigo, Australia, May 2018. Photo by Ven. Lobsang Sherab. 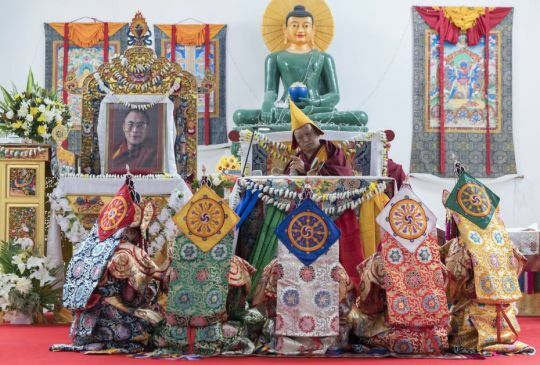 Students are encouraged to use these video and audio recordings by Lama Zopa Rinpoche and Ven. Thubten Dechen to learn the tunes for Lama Chöpa, an essential FPMT practice. During the 2014 Australia retreat, Lama Zopa Rinpoche taught fast-paced, medium-paced, and slow-paced tunes for Lama Chöpa*. High- and low-resolution versions of all three videos below are available for download. Note: Each verse is chanted twice in the fast-paced version. *While Rinpoche did not chant every verse of Lama Chöpa, it is understood that when verses are skipped, one should use the previous tune for that section. Ven. Gyalten Wangmo and Ven. Thubten Dechen offering the long life prayer composed by Khadro-la (Rangjung Neljorma Khandro Namsel Drönme) to Lama Zopa Rinpoche during the long life puja, Bendigo, Australia, May 2018. Photo by Ven. Lobsang Sherab. Ven. 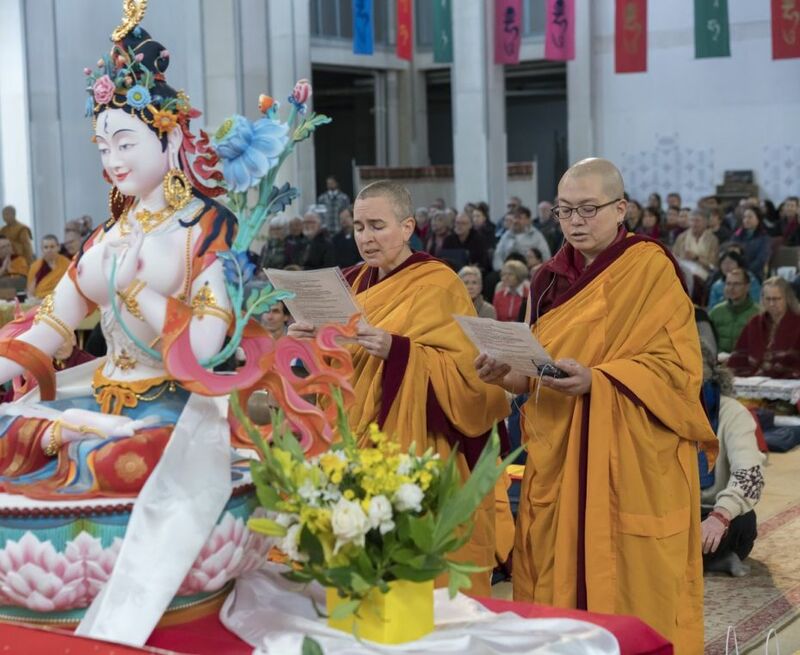 Thubten Dechen’s audio recordings took place over two sessions during the retreat in Bendigo, Australia during March-May 2018 and are now available online. Page references within the recording refer to the FPMT Retreat Prayer Book, 2016 edition. Lama Zopa Rinpoche frequently recommends students to learn from these recordings, which were extracted and edited from the video below. The FPMT Foundation Store has many resources to enrich your practice of Lama Chöpa.